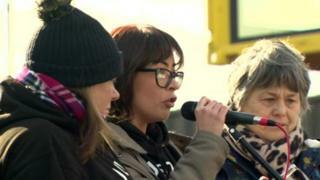 The daughter of a man stabbed to death in east Belfast has called for "no more violence on our streets". Ian Ogle, 45, was killed by paramilitaries close to his home at Cluan Place on 27 January. His daughter, Toni Johnston, told a crowd of about 150 women at CS Lewis Square on Sunday: "Please, don't let my daddy die in vain." Two people have been charged with his murder. The rally, entitled 'Justice for Ian Ogle', was inspired by International Women's Day which took place on Friday. Ms Johnston told those gathered: "No more intimidation, no more drug dealing. "No more so-called punishment beatings. No more bullying. She urged people to "take a stand against these thugs. Stick together as a community." She said a number of families had contacted her since her father's death to say they were also experiencing intimidation. "I have also encouraged these people to report everything to the PSNI. However, sadly, many of them are still afraid to do so," she said. Speaking in the days after his murder, Ms Johnston said her family had been "terrorised" for 18 months.